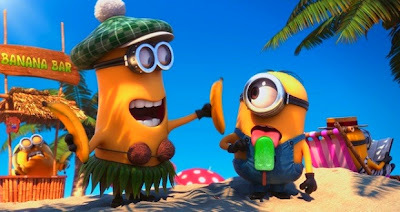 Sunday UPDATE: How's this for a beatdown, Despicable Me 2 nearly tripled-up The Lone Ranger at the box office over the 5-day frame, the Minions mauling Johnny Depp and his ignored-in-the-promos partner Armie Hammer by some $93M. Yeah, that's getting your derriere handed to you and then some. How disastrous was the debut of The Lone Ranger? It couldn't break the $30M barrier for the 3-day weekend, a feat of unconscionable futility. A feat even the much maligned John Carter managed to conquer — youch. Give the Universal marketing department some credit, they've saturated awareness. From McDonald's and Toys "Я" Us (take that AP Stylebook) to Cheetos and Duck Tape, the Despicable Me Minions' goggle-eyed mugs are damn near impossible to escape. The "Bee-do!" breakout stars from the 2010 worldwide smash ($543M large) return to theaters this mega-extended holiday weekend in the saved-by-the-Minions sequel, Despicable Me 2. With buzz off the proverbial charts, expect Gru and his side-splitting stooges to stash prodigious cash in Universal's bank account over the five-day frame and well beyond. Conversely, Disney is screwed. On the heels of their John Carter debacle comes the Mouse House's remake of The Lone Ranger, another $200M+ production that's set to tank in spectacular fashion despite Johnny Depp's desperate promotional push.